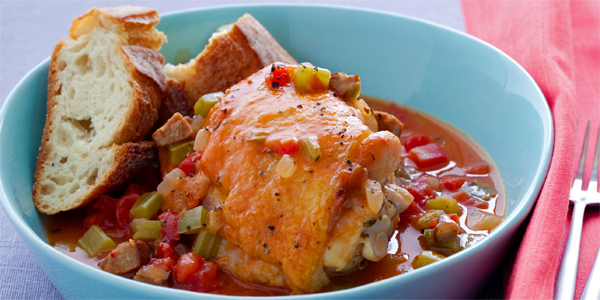 This quick and easy chicken casserole recipe makes the perfect midweek dinner for these chilly nights. Serve with crusty bread to mop up the tasty sauce. 1. Heat a little olive oil in a large frying pan or Dutch oven over medium heat. Season the chicken with salt and pepper. Add the chicken to the pan. Brown on both sides, about 5 minutes, then transfer to a plate. Don’t overcrowd the pan as the chicken will steam, so brown the chicken in batches. 2. Add onion, celery, carrot and bacon to pan. Cook, stirring, for 3-4 minutes or until the onion has softened. 3. Add the tomato paste and continue to cook for 1 minute. Add the wine and cook for another minute. 4. Add the chicken stock and tin of tomatoes and return the chicken to the pan. Bring to a simmer, then cover and turn the heat to low. Simmer for 20-30 minutes or until the chicken is cooked through. Check the seasoning. Stir in parsley and serve with crusty bread to mop up the sauce and a crisp salad. What’s your favourite chicken casserole recipe?